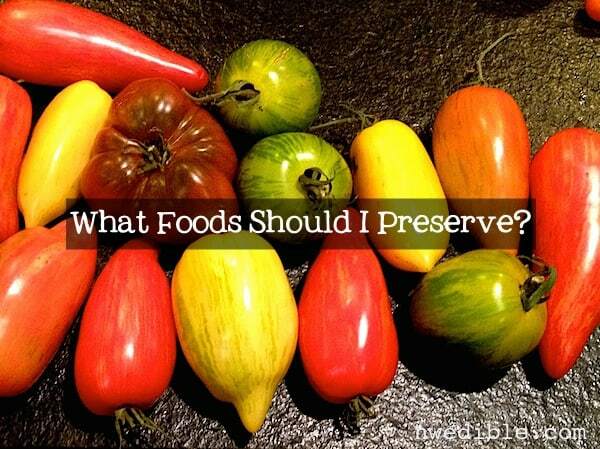 Reader Question: What Foods Should I Preserve? My wife and I are newer to the preserving game and are super pumped on it. Last year we preserved a lot of food but it wasn’t really conducive to living off of. We canned mostly jams, jellies, some pickled veggies (cauli, beans, asparagus, etc) and then did a lot of peaches! What I hope you can help us with is what some of the ‘big ticket’ items are that you preserve every year. If you think of the most useful things that you draw on in winter and early spring, what would those items be? I’ve heard tomatoes so we are planning on that this year but what else? Also, I don’t think I will ever using pickling vinegar again. It tastes terrible and is so strong that I’m the only one in the house who ends up eating the pickles. It depends because every family eats a bit differently. I can tell you what is the most useful to me but I think the most helpful thing is to look at how you and your family eat. When you go grocery shopping, what do you buy? What condiments, meats, pulses, and vegetables make a regular appearance on your table? How you eat needs to direct what you preserve if your goal is a larder that actual helps you cook day in and day out, eat well and save some money. We love to eat stir fries, pasta, tacos, pizza and soup. My wife and daughters typically eat ‘snack lunches’ which most often consist of veggies, hummus and bread or crackers. I would say those are the big hitters for us. We find a different way to eat tacos every week which is great and then on the weekend I bake our bread for the week and make pizza. We often make large pots of soup so that we can put a significant amount in the freezer for easy lunches. The big hitters at the market are definitely fresh veggies (as seasonal as possible), some meat products, noodles and flour. We also buy canned tomatoes and tomato sauce. Crazily enough, I discovered this last week that my kids love Sauerkraut which is hilarious to me. I made a quart of it and they just devoured it so I guess we can add fermented cabbage to the mix 🙂 Pretty much we are open to trying anything. We throw all kinds of different ethnic foods into the mix each week too, like Thai, Indian, Mexican, Japanese, or Vietnamese. Things on noodles are definitely a fav! You can preserve all these yourself, but if you buy the tomatoes to process you’ll probably pay more money than it would cost to get a #10 can or case of tomatoes at Costco. If you are buying tomatoes, figure 2.5-3 pounds of raw tomatoes per quart jar to get an idea of the ingredient cost for your finished goods. If you grow the tomatoes you’ll save a lot of money here. Homemade tastes way better and you’ll know where they are coming from. So it’s a judgement call based on your personal money/time/food values assessment. I’d do canned whole or halves for pasta sauces, Indian braised dishes, soups, stews, and basics too numerous to list. 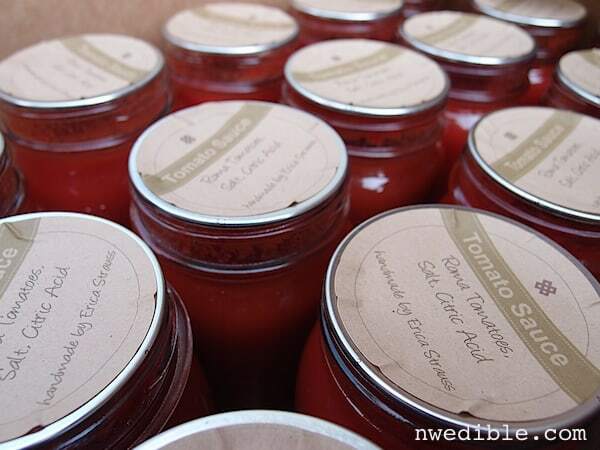 I can 200-300 pounds of whole tomatoes each year in order to have 1-2 quarts a week on hand all year round. That might be more than you need, but it goes to show how versatile they are. Possibly consider a dedicated pizza sauce given how often you have pizza. You’ll need to follow an approved recipe here – no throwing in big handfuls of garlic and fresh basil and olive oil – so you may find, as I have, that it’s more versatile to have a basic sauce on hand and season it up to taste. One pint jar of tomato sauce + one small can of tomato paste + seasonings makes a good pizza sauce without further cooking. Tomato paste: I find it makes more sense to buy a case of organic tomato paste than to make it. There’s just too much time involved for paste and too much risk of scorching. Your milage may vary, of course. With all the tacos you eat, salsa are a great place to go homemade. Water bath canned salsas require following an approved recipe, lacto-fermented types are more versatile if you have a family recipe for pico de gallo you love. I make at least three kinds of salsa a year because I will eat it a jar at a time (no joke, I’ve been known to get sides of chips and salsa at Mexican restaurants and just spoon the salsa into my mouth.) 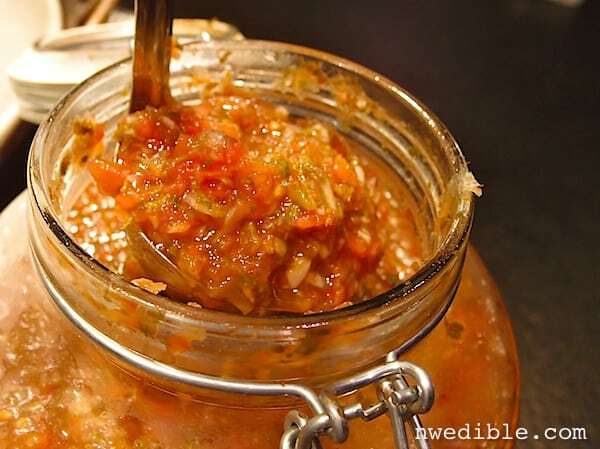 I love the Roasted Corn Salsa from Food In Jars, The Cilantro Peach Salsa from Canning For A New Generation, and the Cultured Pico-de-Gallo type salsa I ferment (recipe here). Salsas are an awesome way to literally spice up cheap grocery store staples – rice and beans type meals are so-oh-oh much better if you have a half cup of roasted corn salsa to top it with. Don’t overlook using salsas as a mix-in ingredient, too. I like to combine a fruit salsa (like Peach Cilantro) with a can of coconut milk to make a fast Thai-ish style simmer sauce for meat or veggies. Super convenient eats, legume version. Canned dry beans – sounds like an oxymoron, right? Basically this is taking dried beans like pintos or black beans and pressure canning them. This gives you the insane convenience of a shelf-stable, fully cooked protein source for the price of….well, beans. Canning dry beans requires a pressure canner (this is what I have) – you absolutely cannot process beans in a boiling water bath canner. But if you have a pressure canner or are willing to buy one (look for used models to save money but have the gauge tested before use!) you can turn a very inexpensive staple into an easy convenience item for almost nothing. Garbanzos are my favorite legume to can. The texture turns out great. I make big salads of marinated chickpeas and veggies in season. And of course, if you have a can of cooked chickpeas on hand, you are a quick puree away from hummus. Since your wife and kids eat a lot of hummus, this could be a big win on the homemade front. Super convenient eats, animal version. As long as you’re getting a pressure canner for chickpeas, you might as well learn to can meat. Commercially canned meat – chicken, beef, whatever – tastes terrible to me, but home-canned meats can be absolutely delicious. The trick is to use cuts – like pork shoulder and beef chuck – that you typically have to cook for a very long time to tenderize anyway. I typically cube the meat, then pre-sear fatty braising cuts under the broiler just to render some of the excess fat out of the meat, then process the meat as directed here. If you get in the habit of canning your own meat, you can add seasonings as you like, and these permeate and flavor the meat during processing. Try garam masala. It makes meat taste meatier. I love canned pork shoulder for tacos. It tastes like slow-braised pork, because basically it is. Or, think down a more Bahn Mi route to get your Vietnamese fix and hot up your canned pork with chilis, cilantro, and fish sauce before spreading it on a nice baguette. Top with an Asian-style slaw or quick-pickled veggies for an awesome sammie. A few jars of canned beef chuck, plus some canned black beans and canned tomatoes – add seasonings and it takes about 20 minutes to put chili on the table. Since you eat meat, good tasting canned meat can be a huge time saver. I cannot tell you how convenient it is to have pre-cooked, good quality meat in the pantry for those nights when you are hungry and home late and didn’t thaw anything and are this close to ordering take-out. Depending on your personal financial-to-food ethics assessment, you can get the bulk cuts of meat at Costco (cheaper) or as part of a bulk buy from a local farmer (more ethical). I encourage meat eaters to see how they can shift their meat dollar towards more ethical sources of meat. Sometimes this means going with the cheaper cuts instead of steaks and chops. Luckily these cheaper cuts tend to be more flavorful and the best for pressure canning. Pickles prepped for traditional pickling aka fermentation. Since your kids like sauerkraut, there’s a real opportunity here to go down a very healthy, delicious direction of food preservation – lacto-fermentation! Like vinegar pickles, fermented vegetables are preserved through acidification of the food product. The difference is what acid and where it comes from. In vinegar pickles, acetic acid (aka “vinegar”) is added by us, whereas most fermented veg are acidified when the natural digestion process of several beneficial microbes converts carbohydrate to tasty, tasty lactic acid. Fermented foods have the advantage of being fast, easy and energy free to prepare. (No giant pot of steaming water in late August). They are also freakishly healthy and, according to, well, me, some of the most delicious foods in the whole world. Fermented foods tend not to last quite as long as water bath or pressure canned foods, and they are alive which means it’s normal to get subtle flavor changes over the life of the food. To extend the storage of fermented foods, ferment in the largest containers you have that will not pose a storage problem or create too much of the preserved product and store in the fridge after the initial fermentation. I had several 1-gallon containers of fermented salsa way that lasted over a year stored in the fridge. You know that scene in Portlandia? – “We Can Pickle That!” – that’s kinda true. There are very few limits on what veggies you can ferment. I love fermentation-pickled spicy green beans and carrots. The only thing I’ve had very bad luck with is raw beets. I recommend Wild Fermentation if you want to learn more about fermented foods. Jam: good for bread, and lots more. Various sauces in the pantry make quick stir fry meals even quicker. I recently made a pork and veg stir-fry and finished it by dumping in a jar of plum-soy-ginger sauce from the pantry. Very time saving and delicious. Since you like Indian food, think about making a few small batches of seasonal chutneys through the year. These will go a long way to turning a pot of basmati rice and some lentils into something fantastic. Bases like tomato, fig, mango, pineapple and more make great chutneys, but do follow approved recipes for canning so you know how many onions and whatnot are safe to add. If you want to just play around with flavors or add mustard oil or other things that are frowned upon in canning, just freeze for chutney instead of canning it. Too-many jams can be MacGyvered into awesome sauces for that kind of dinner. Add a bit of soy sauce and vinegar and sesame oil to peach jam and now you have a peach stir-fry sauce. A little mustard with apricot preserves? Now it’s a glaze for roasted chicken breasts. I use most of my sweet preserves like that, honestly. 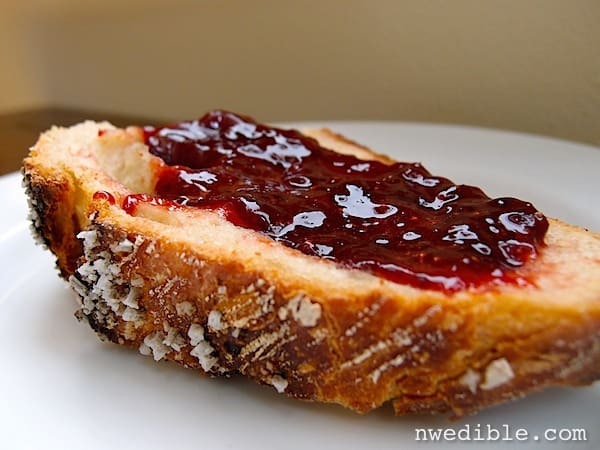 This post talks more about ways to use typical sweet preserves in savory applications. A bunch of canned peaches are great, and once you’ve canned one fruit you’ve got the system down. Pears are quite good canned. You can also play with seasonings. Last summer I made the bourbon canned peaches from Food In Jars. Fantastic. Maybe not so good for the kids, but great for a special treat for grown ups. Dried fruit is also used in our baking, on hot cereal, and is added to pilafs and salads. Think dried apricots with couscous – that kind of thing. 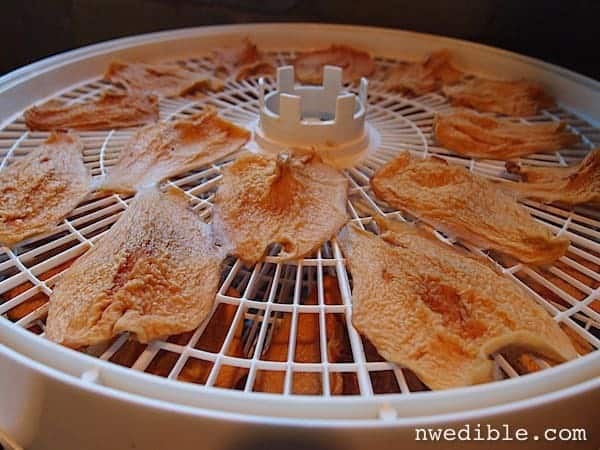 You can also do fruit roll-ups naturally in a dehydrator – this is good if you see a screaming deal on stuff like mangoes or peaches that are a bit over-ripe. Peel, puree, dry and viola! Fruit roll-up! Kids love these. This is a good tutorial for mango fruit roll-ups. What are your must-preserve items? Do you think about how you eat and planning what to preserve around that, or do you just jump in when the produce looks good? PS: Do you have a question you’d like me to tackle as a blog post? Please drop me a line with your questions, stories, challenges and more. I get a lot of emails so I can’t address everyone’s question but I will do my best! P.S.S: Do you have money burning a hole in your pocket, or do you just need to make some sensible investments for your productive home? Here are the items I use and recommend for food preservation, etc. All links are affiliate links, which means if you buy through them a small percentage of your purchase goes directly to support this site – but your cost stays the same. More info on all that stuff here. Thanks for your support, guys! My pressure canner. I have the 30 quart model, which is a beast. B-e-a-s-t. What I like: no gasket to wear out, weighted gauge so no need to check your dial gauge for accuracy every year. I had a bit of a saga when I initially bought this thing, but it has really proven itself. My food dehydrator. What I like: it does the job, has even heat, a good fan, simple controls, is decently easy to clean and it’s moderately priced. But my dream dehydrator is the Excalibur with stainless components. Maybe one day, when I find $500 on the sidewalk or something. My favorite canning and food preservation books: Food In Jars, Canning For New Generation, America’s Test Kitchen DIY Cookbook and Wild Fermentation. Of course, every canner should have The Ball Blue Book and Putting Food By. How do you grow enough tomatoes? It’s one thing I can’t seem to have enough of, even the years I don’t have problems. Going into my fourth year with my own garden space, my garden philosophy has changed from “let’s plant every type of seed we can find!” to “let’s focus on the things we buy in bulk anyway!” We don’t have enough garden space to be self-sufficient, so we are still part of a CSA for our weekly eating vegetables, and then will probably continue to plant 30-40 tomato plants for canning. Last year I didn’t really think about how many tomatoes that would give us, and also bought a hundred pounds for canning, since the year before I’d had to buy 150… we still not only have jars but also bags and bags of frozen tomatoes in the freezer. Whoops! I didn’t even like tomatoes before growing them myself so I have to force myself to include them in meals. I can extra tomato-cilantro salsa as it makes a great base for a quick tomato based curry. Just heat your choice of spice in oil (cumin, garam masala, turmeric, mustard seeds….what ever you normally use) and then add diced potatoes, chopped cauliflower, garbanzo beans (cooked) a pint of salsa and enough water(or broth) to simmer and cook the vegetables. Add frozen peas at the last. I really enjoy your blog. You do quite a bit of “homework” in what you present and remind me a little of my younger self (before we could blog). My husband and I raised our 6 children in Southern Oregon on a 10 acre mini farm. We both were city kids who met in the Army back in the 70s… when my husband decided to retire early (only 41) we moved to Oregon and started the farm. I still have two pressure cookers and canning supplies from those years in the 90s, I was no where near the depth and research for our canning experiences, but of course internet was just being talked about in the news and not even in the workplace yet. Alas, with 6 kiddos I needed to add to the family income. I returned to my passion in education full time. Now 20 years later, I have reminisced often of those edifying years for our family….but life goes on and children grow up (Hmmm that’s part of a song lyric, I think). Anyway, your writing has me longing to garden and preserve foods again, maybe as I head toward retirement I’ll begin a miniature version of the homestead life we had. Thanks for touching a part of me that I thought was resting in peace! My biggest once a week canning is in “Ready-to-Eat” meals. I’ll do a big harvest from the garden and make a huge soup or stew. I clean out the frig (herbs, meats, beans, rice, veggies) so nothing goes to waste. This soup will cover dinner and 7 quarts (7 dinners) in the pressure canner. Done once a week for a month puts a months worth of dinners on the pantry shelf. That really comes in handy down the road when my brain goes blank on what to make for dinner. Also, when friends are ill I’ll put together a “Week of Dinners” for them, include some homemade jam and a loaf of homemade bread. Great idea. I do something similar – I have a “Clean out the fridge” soup on the back burner right now, actually – but don’t typically pressure can the resulting soup. I could live off the soup for a week and that would make my life a lot simpler but my husband is not going for it. He’s good for once for dinner and once as a left-over for lunch (or dinner again) then he’s burned out. We have access to as many apples as we care to pick from an old farmstead apple tree, so I tend to can a lot of fruit sauce – some plain apple, some mixed with other fruits. We eat quite a bit of it straight from the jar, and some gets used for baking. We dry a lot of apples as well, and then usually experiment with a recipe or two that looks interesting – jam, pie filling, whatever. The tree tends to only produce every other year, so the rhythm there is a little different. Beyond that, most of our staples are things you covered. I found that I’m not a good judge of what and how much we actually eat, so I tend to go for the simplest possible product – plain tomato sauce instead of herbed, plain fruit without extra flavors. This makes it easier for me to improvise with them later instead of being locked in to one flavor profile. I do keep a spreadsheet where I keep track of what I can, what recipe I used, and any notes. Then each year I reference that and compare it to what’s left and make adjustments. If we ate something all up, I try to make more. If most of it’s still hanging out in the larder, we may skip it that year. Trish, it might help you to know that it is very common for uncared for apple trees to cycle every other year like that. It is caused by an overabundance of apples being on the tree as it is growing next year’s fruit buds. If the apples were thinned it would be more consistent. But if you’re preserving them, probably not worth the effort in my book. I’ve been playing with fermentation, but in the end the limiting factor for me is the need to refrigerate the end product,unless I am willing to kill the good probiotics by putting them through a hot water bath. We don’t have the room to refrigerate all that I would like to ferment! Am I missing a key concept here? Nope. You aren’t missing anything. I have a second, outside fridge for exactly this reason. Traditional style cool storage (as in a root cellar) is how ferments were kept before refrigeration, and sometimes dry, cool storage can be achieved in a modern unheated garage or other outbuilding. Otherwise, small batch seasonal preserving is your best bet. I know I’m late to the post-party here, but is there any official definition of “cool and dry”? My downstairs always stays cool (or quite chilly even) year-round, and now you have me wondering if it counts. thanks! These ideas are fantastic! 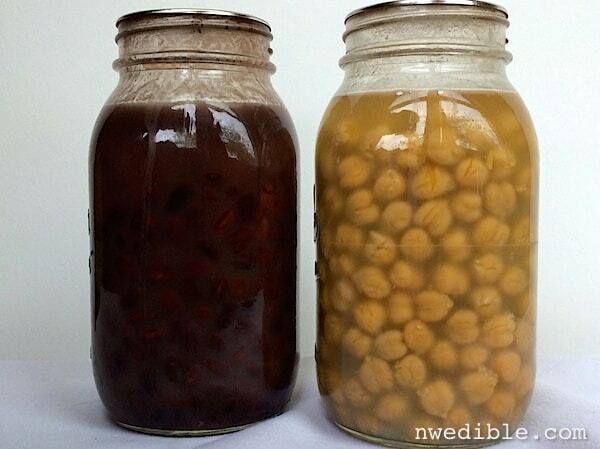 Do you recall where you found a tested recipe for pressure canning dry beans? The Ball Blue Book gave me the impression that dry beans shouldn’t be canned–but maybe I was reading it wrong. I would LOVE to be able to can my own Guatemalan-style black beans. Oh, you can totally can dried beans. You just rehydrate them first. Here’s the official guidelines. I am fairly sure you can’t process something like a prepared mashed or refried bean type dish – the density would be too much to ensure safe heat transmission. But for loose beans, pressure canning is totally ok. I have seen unsafe instructions elsewhere online saying that it is okay to can dry beans without rehydrating them first. I’m glad you do not recommend that. I was so intrigued by the idea that I called and spoke with a canning expert at WSU (one of the professors there) and he confirmed that it is a very unsafe practice. Beans can need variable amounts of time and water to rehydrate depending on their age, and there is no way to can them without the rehydration step. Your blog is my favorite, and actually the only one I keep up with regularly. Such good advice. Especially on the cost/time factor decision making. The only thing I would add is: Don’t try to start preserving EVERYTHING at once. I started canning/preserving just due to growing more produce than I could use, and then a switch went on where I looked at my pantry and wondered what I could make myself. But it certainly didn’t happen all at once: I added a few things every year. And it’s fine if some things are just not worth it for you. I’ve canned beans and I love the idea of it but the difficulty/cost/enjoyment balance isn’t working out for me yet and I’m okay with that 🙂 But on the other hand, pressure canning broth is SO EASY and is a cheap/convenient item in so many things–and superior quality to what you can buy. Pressure canning broth – what a great idea! My partner is Greek and the classic avgolemono soup of chicken broth, lemon, egg, and rice is a favorite comfort-food in our home. Commercial broth just doesn’t cut it for flavor, even the organic, high-quality ones. So I’ve tended to make it only when I have a leftover chicken to boil & I freeze the extra broth. But canning it is a much better idea! I didn’t know it was that easy but I’ll be trying it for sure. Thanks for the tip. Thank you for this informative post! I’m in the process of rethinking what foods I am going to preserve this season and how. In years past I have, for example, made a lot of jams even though I don’t really care for sugary treats that much. This year, I’m planning to get a dehydrator because I love dried fruit and buy them frequently during winter. What dehydrator model do you use? I’ll second the recommendation for the Excalibur. I have the 9 tray plastic model – going on the 3rd year now. It’s been awesome. I also use it for other things than just dehydrating food, e.g. making sure saved seeds are really dry before storing them. Without a doubt the Excalibur is the best dehydrator. You do not need to get one with a timer. And I have a 5 drawer that I am very happy with. You are such an awesome resource, I really love your blog and wish you were on my coast so I could harass you with region-specific gardening questions 🙂 Thank you so much for all of the effort you put in! I can pasta sauce, lots of it. Pickle radishes, bush beans and cucumbers. I dehydrate tomatoes, cherries, apricots. I also make tomato paste, although I freeze it rather than can it. Too often I have had to open a can of tomato paste and not use it all. After making the tomato paste, which is a simple process of letting the tomatoes cook down, I put spoonfuls on waxed paper on a cookie sheet and stick it in the freezer. When frozen I put in a covered container and take out little frozen bits as I need. You have inspired me to get a pressure canner this year. That’s a great idea for preserving tomato paste without breaking out the teeny tiny jars. It also dehydrates really well. I use a thicker sauce and dry about a tablespoon spread out like fruit leather. Thanks, deb g, would not have thought of that! I also freeze little bits of things that go unused and often spoil in the frig, such as tomato paste, roasted peppers, leftover Thai curry pastes, cilantro and/or parsley slurry, veggie water from the steamer (for future soups), etc. I also have at least one gallon bag of frozen berries, cut up tomatoes, cooked winter squash and shredded zucchini in large cupcake molded shapes, and small bags of individually frozen par-boiled string beans in water (the best tasting method so far) in the freezer. I can apple and pear sauce, tomato and spaghetti sauce and all sorts of fruit jam combinations (also makes an easy salad dressings with added oil and vinegar). I also made dilly beans one year and tossed in baby squash with the string beans. Yum! I dry any fruit in season (really surprised myself with the kiwi), cherry tomato halves (great rehydrated and into pasta salads or meatloaf), and sliced mushrooms that I find in 5# bags on sale at the grocery story every now and then. We grow the things we eat (except I like to grow more winter squash than we can eat…), and if we can’t eat it all at once then it gets preserved somehow. I grew up with a mom using a pressure cooker often for dinner and I think I’m permanently averse to using one of those, or a pressure canner. I know I’m missing out… When you open my freezer you are met with zillions of rolled up double zippered freezer bags of various things because those bags can be washed and reused multiple times, unlike the seal-a-meal plastics. My 13 yr old would eat a pint of my dilly beans EVERY day after school if we had em! & I can actually grow lots! So that’s what I’ll be doing tons of this year! Wow Erica—such an interesting article. Really took me down memory lane. My mother was a old farm woman (came through the Depression) and she canned everything she could get her hands on when I was growing up. Of course I HATED it—especially having to help prepare the stuff and the big boiling pots of water in August that you mentioned. SWORE that I would NEVER do it. I do have a small community garden now (no place for anything else except pots on the patio) and am getting more interested in preserving what I grow. But I still say I will NEVER shell blackeyed peas again! 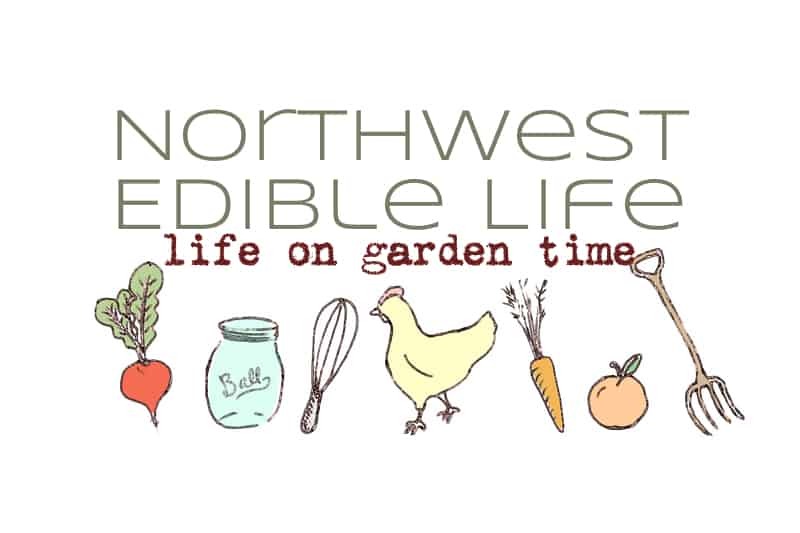 Love reading your blog even though I can’t garden on the scale you do. You didn’t mention Pesto!!! I make huge batches of Pesto with home grown basil and hopefully home grown garlic as I planted a ton this year! Drop small amounts into ice cube trays and freeze them. Then pop them out into freezer bags for easy access. Great for both Pasta and Pizza! I like to use a lot of pesto so I freeze them in muffin tins. Dehydrating is another great way to preserve your garlic, especially if you find you have a lot left at this time of year and they are starting to sprout on you. I use whole garlic chips in cooking or pulverize them in the food processor. Popcorn with olive oil and garlic powder is the best. Popcorn with olive oil and garlic powder! Yum! I’ve drizzled melted butter with toasted Cumin powder on mine for years and of course I love Parmesan cheese too! I find home-dried garlic powder far preferable to the store bought stuff I used to buy. I swore off garlic powder entirely for years, actually, then one year had a bunch of garlic at the “use it or lose it” stage so I chopped it and dried it. I love using it in my canned garlic dilly beans. So good! Pesto is awesome! You’re right – that’s a staple around here too. I make pesto from a portion of our garlic scapes and freeze it in ice-cube trays. I thin it out with more olive oil once thawed. Great stuff. I fell in love with making chutneys years ago when my neighbor had a huge and largely uneaten fig tree. I conjure my own recipes and plum chutney is my favorite, and the most surprising recipe was the year my tomatoes did not ripen and green tomato chutney was born. Delish, and so great for gift giving. I’m now down to my last jar and am hot to make new friends who have fruit trees this year. One year I grew a salsa garden, everything I needed for tomatillo salsa and a fresh pico. It was divine, and I had tomatillos reseeding for years. Thanks for the very inspiring blog darlin! Erica, If you’ve ever thought about developing a book, this should be it. There are so many great books on how to preserve everything under the sun, and other books on how to do each of the homestead tasks. But what’s really lacking out there (and I say this as someone with a lot of cooking and household management skills) is a book that pulls it all together for real, urban (in the sense of not full-time homesteading and still living in the modern industrial world) family life. How to integrate all the gardening planning WITH the preserving WITH the cooking (your recipes are a cut above the farm cooking that I’m doing! ), WITH the seasonal realities, and WITH the realities of needing to put fast easy meals together on busy weeknights. And have snacks! I WOULD LOVE TO BUY SUCH A BOOK!!! Please consider it as a project…please? Your writings are so ‘user friendly’ & I feel like ‘If you can do it, I can do it’. My favorite inspiring magazine by Taunton Press was Kitchen Gardener that did just that. I’ve used many tips from those issues before they stopped the presses on that most practical publication about a decade ago. I love this post! It gave me some great ideas to try this year, and made me hungry too! I just wanted to add a (hopefully) helpful tip for people who are new to canning, or are really busy, but still want to participate in the tradition of canning. As a single working mom, it is overwhelming to me to even think about trying to can a hundred (300!) pounds of anything. A few years ago I was really frustrated because I did want to participate in the tradition of canning and providing the benefits of such to my family, but it seemed like a lot of the canning information I had found was more focused on the “go big or go home” type of canning. Nothing wrong with that, for sure, and someday I hope to be able to fully stock my pantry with my homemade canned goods. But then I found out about small-batch canning on Food in Jars (http://foodinjars.com/tag/small-batch-canning/). This technique is what works for me and my family, as I can do a batch on the weekend, but still have plenty of time for family, activities, etc. Also, I am not a fan of being stuck for hours on end in a hot August kitchen either! I highly recommend checking into this if you are just starting out canning (or are just really strapped for time) and want to have a little of that pride of seeing your own canned goods on the shelves. Oh Thanks Regan! I was intimidated about all that ‘big cache’ canning too. I tend to freeze leftovers from a Sunday Chicken or Roast cause big commitments of time are rare. I’ll separate the meat from the stock & freeze them in cup or pint freezer bags. Even if I don’t have time to cook down the carcass I can throw it in a gal bag (after cooling) & cook it down later. I always save my steamed veggie water this way, makes for a quick stock in a pinch for time. Can you expand on how you can your pork shoulder — specifically, do you use the hot pack method of the raw pack method? Because I like to use fairly fatty cuts, I prefer pre-searing to reduce the fat in the finished product. So I typically do hot pack with broth. That said, I’ve done both pack methods with pork shoulder and they’ve all turned out fine but raw pack meat will throw a lot of fat . I am scrupulous about cleaning jar edges though – I do a vinegar wipe to make sure the grease is all off before lidding. Thank you — I agree that rendering the fat from the meat first is more appealing. Any chance you have a favorite “how to” when it comes to meat canning? I’ve been Googgleing around for videos and he trange of experience is quite large. Absent of a video, perhaps an article, favorite cook book, dedicated to the topic of meat canning? This is something my family would eat a lot of….but it’s a bit intimidating to me. I recently discovered meat and bean canning in the oven. It’s dry, (no messy water if any of the jars leaks grease, like at least one of mine does once a year) and you can set a whole batch of jars on a cookie sheet, slide them in, and forget about them for a few hours. It makes the job so many times easier since a rack full of jars is many more than my pressure canner holds. I’d give you the specific temperatures and times for the meats but don’t have them in front of me right now. It was one of those “where have you been all my life” tricks worth discovering sooner than later. Unfortunately, while convenient, oven processing is not considered a safe processing method – particularly for low-acid foods – because of slow rate of heat penetration of air vs. water and the massive variabilities in ovens and hot spots which make it impossible to make specific recommendations for how long food would need to be processed to guard against spoilage bacteria, pathogens and spores like c. botulinum. Oven canning also has an increased risk of exploding jars. While you will find sites that encourage oven canning, all official sources for canning safety agree that it just doesn’t ensure a safe and wholesome canned product. Therefore, I’m afraid I must recommend against it. Here’s additional info. Erica, I am in total agreement with you. And thank you for your thorough explanation. It just isn’t worth someone losing their health or their life because we do not follow approved procedures. We are so lucky the information we have today. 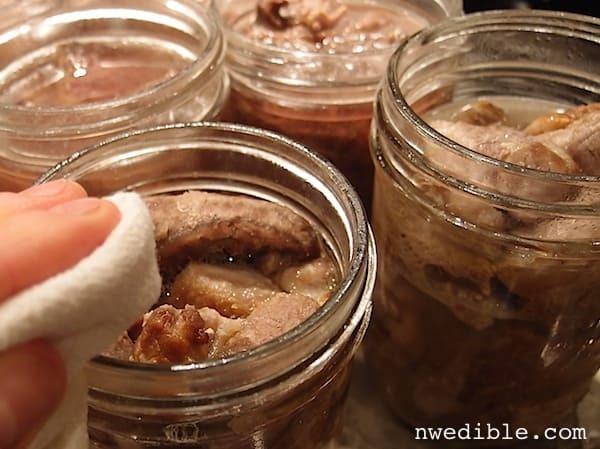 Do you use quart or pint jars for your meat — sounds like one pint holds about a pound of meat? I’m looking at getting a dehydrator. I got my hands on a tonne of free tomatoes last year (my life is so hard) and would have loved to dry – or even semi-dry for freezer-storage – some of them. Same with the apples from my friend’s yard, and the tonne of free serviceberries available from the street-beautification-project trees in my neighbourhood. Between that and the potential for making kale/sweet-potato chips at home, it’s looking like a good – and affordable – investment. I just have to figure out where to store it when it’s not in use. Tomato sauce. I buy tins of diced tomatoes from the grocery store, and will likely keep doing this, but I love making my own tomato sauce. It’s relatively fast and easy, my friends *love* it, and we go through a couple of tomato-friendly meals in a given week (this is SUCH a change from three years ago, I don’t mind telling you). I wouldn’t mind doing home-canned crushed/purreed tomatoes as well but I need to figure out how to do that properly. I also do tomato-peach salsa (which I love, and which I’m hoping to addapt to apricots if/when I get the chance to grow an apricot tree in my neck of the north-of-the-49th-parallel woods – it could happen!) – three jars last summer, but I think I’ll do quite a bit more now that I know how to get the spice levels right – and am considering a tomato-onion chutney that a friend makes beautifully (maybe I’ll just set up a preserves-swap with her). 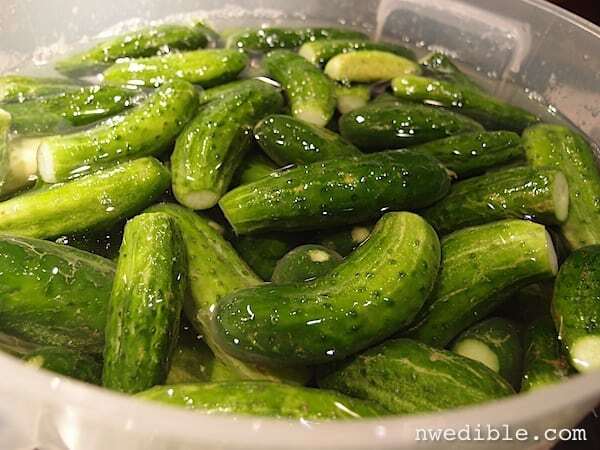 Garlic-dill cucumber pickles: I *love* sour stuff, and I make good, mustard-and-black-pepper heavy pickled cukes. I don’t entirely know how to work them into things like Winter Salads – though I’d love some suggestions on that front (like radish pickle thrown into a remoulade, for example) – but I enjoy them as a side-dish or a snack quite frequently, so they work out. Along with the above-mentioned tomato sauce? At least one, sometimes two meals per week involve frozen spinach/kale/chard/wild-greens/etc. Or frozen broccoli. Or even frozen edamame (I want to try making “edamole” for a northern zone substitute for guac… sacrelige, maybe, but I want to give it a go). I can see home-freezing blached (shelled) butter beans and continuing to home-freeze blanched hardy greens of various types, but stepping up the production a little bit on that front. Frozen greens (or broccoli – which I suspect I’ll continue to buy rather than DIY, unless I start getting a lot of brock in my CSAs) are INCREDIBLY versatile – quiche, stir-fries, pasta, stew… you name it – and are also amazing just re-steamed and served with a splash of blasamic. I <3 hardy greens. Hurrah! Frozen fruit – while frozen cherries and currants are great for pie? Frozen *berries* (serviceberries again) are an important part of one of my favourite breakfasts (yoghurt + berries + nuts + a drizzle of maple syrup). This year I'm hoping to harvest about as many serviceberries as I did last summer but, unlike last year (when I made something like 3 litres of serviceberry jam, maybe a little more) I'm going to freeze as many as possible this year so that I don't have to ration them and can throw them into yoghurt and pancakes and such-like with abandon. But, yeah. Frozen greens, frozen berries, fruit butter, cucumber pickles, and Tomato Things. Those are my go-to items, and they serve me well. I had a couple of years where I made all of my own jam, of the canned and frozen variety. I’m just getting back into doing that now. I do make all the poultry and beef stock we use (frozen). I recently started making the ketchup we use. I was a big fan of Heinz until I started making my own, and now I can’t go back. I’m hoping to work out a mustard recipe I like next. I also make a fair bit of cranberry ketchup (frozen also). I dry a lot of fruit for snacks. It’s gotten to the point where friends and co-workers will give me their leftovers when they buy bags or boxes. Last Thanksgiving-ish, I ended up with about 30lbs of apples from three or four different sources, all within a single week. I made applesauce, pear-&-applesauce, and dried apple slices from it all. I made tomato sauce and pasta sauce from the tomatoes in our garden too. Not quite enough for a jar a week for the year, but still enough for some serious eating. I’ll definitely be doing that again. We were doing a kefir and sourdough starter for several months, but something happened to both of them over winter, and I need to get new strains going. I’m hoping, over the next vacation I have, to get a yogurt started as well. I can’t believe you didn’t mention canning fish – particularly salmon. We are a PNW family and we pressure-can (the only safe way) whole salmon when it is running and tuna during that short 2-week period mid-summer that is available locally. Relatively easy – you just chop up the whole fish in slices 1″ shorter than your cans (we use pints and half-pints) and stick it in with bones and skin. When we mix up our canned salmon, we use our green tomato relish – another PNW must because you always have at least as many green tomatos as red. Nicole, I live in the PNW also and have rarely encountered anyone who cans fish. I would love to do my own but would like to get recipes from someone who knows what they are doing. I understand the slicing and dicing but what herbs and spices do you use and what liquids do you fill the jars with? Processing times? Any additional information would be greatly appreciated! P.S. About 20 years ago my husband was given a jar of canned salmon. The label said “Joul”. I have searched this name but can’t find anything on it. It was so delicious! My husband can’t remember who gave it to him. I can tomatoes last yr I did 17 QTS this yr I did 34 I think I will shoot for 50 this year because I still had to supplement one store canned tomatoes. I did lacto fermented peppers and made a siracha style hot sauce and a simple Mexican style hot sauce both were better than store bought and cheaper. Pickled fennel bulb is my new favorite pickle! My sour kraut never turns out well either my cellar is wrong temp or I just need to refrigerate it I did get one good meal out of it and 2 wks later it was slimy and gross? I have a few gourmet preserves I use a lot, pear agri dux and Carmel cippolini onion agri doux both r good for charcrute plates among many other uses. I make ketchup we don’t use a ton of ketchp in our house but when we do this is well worth the effort. I also make tons of pesto that I just freeze in ice cube trays. Jams jellies kind of round out the home made stuff in pantry along with some other random things I did for fun in small batches. Oh and home made fruit scrapp vinegar so far apple, pear and pineapple have been the best, have some promising elderflower vinegar saving right now as well. I am thankful for this post! Lots of great information and the recommended resources list came in handy today as I was at the library in the “for sale” section (which I check for gardening books every time I am there). I found the book “Putting Foods By” for 50 cents and only realized it was a good resource since I had just read your post! Seriously, thank you for all your time and effort and sharing of your brain! I freeze grated zucchini and other squash in ice cube trays or muffin tins, to use in soups and in baking. Also, this year I plan to freeze fresh fruit in season, large batches of it. As well as whole tomatoes, again to add to soups and stews and in making a quick tomato sauce. I love this! I wonder: does freezing whole tomatoes have the same effect as freezing whole peaches? The part where you can just rub the skin right off. Yes/No? Yes, tomato skins will slip right off after they’ve been frozen. I usually dump the tomatoes in my soup and then fish out the skins as they float to the surface. Last summer I challenged my self to see if I could grow enough vegetables to see myself through the winter. It turned out pretty well, as one of the things I did the year before was to keep track of what I was harvesting and when, that way I could plan how much and when I should put things in the freezer, or dry. One of the best things were the mixed vegetable bags, for the freezer. (I intend to change to glass for the freezer, rather than plastic). Each quart bag was filled with (blanched) summer squash, green or roma beans and a green. So much is coming so fast in the summer, it was easy to blanch each veg separately and then fill the bags with the cooled vegetables. So easy in the winter to make a nice soup or add to a stirfry and have the ingredients ready to use. If you need a bigger batch, just add another package. I do wish we hadn’t eaten every single delicata squash and saved a few of those, and the dried pears did not last at all — just call them candy! This year I am planning to put some winter squash in the freezer as it does not last in storage until March and it would be very nice to have some pumkiny things, soup, bread, pie, in the early part of a chilly springtime. I did have to buy a couple of bags of organic carrots, but all in all I would call this experiment a success! Question? A few of you have mentioned freezing in glass rather than plastic. I like the plastic because I can freeze them flat, then file them like books in the freezer (I think Erica mentioned that). Though perhaps I’m missing something… are Freezer Bags ‘food safe’ or is there chemical leaching (as in water bottles) that I’m not aware of? My counter top convection oven turned out to be great for drying. Granted, I work with much smaller quantities than other gardeners, but for me it’s been a great alternative to a dehydrator. Last year I used it for drying the last of the cherry tomatoes in my garden, which I then froze and used in place of tomato paste. This year I’m planting extra herbs so that I’ll have enough for drying, and I just might try drying garlic while I’m at it. I also freeze stock in canning jars, which I find so much more convenient than freezing in ziplock bags. I haven’t tried pressure canning yet, but I’m tempted to learn so that I can keep stock in the pantry instead of the freezer. While we’re talking book resources, can I recommend Well Preserved by Eugenia Bone? It’s a great resource for all types of preserving (including fish, which I saw mentioned upstream) and also has great recipes for each type of preserved item. I just can’t get past how energy-intensive it is to can tomatoes. Last year I blanched them to get the skins off, froze them on trays, and then packed them in ziplock bags. I’ve got a freezer running all year anyway, so I may as well keep it full. I was very happy with the results and I’ll do it again this year. If you take as many tomatoes as you need out of the freezer 15-20 minutes before you need them, they slice really well semi-thawed. I also blanched and froze masses of green beans, carrots, and corn. I know everyone likes the shelf-stable canned stuff, but freezing makes more sense to me time and energy wise. I happen to like shelling dried beans and peas in the evenings while we talk or watch a movie, so we’ve got plans for even more of those this year as well. I haven’t read all the comments so this my be a repeat sorry if it is. Things I have pickled that you may want to think about trying. Remember there are a lot of pickle recipts out there, if you don’t like one try another. Last year I pickled the green tomatoes at the end of the season, they are great in a salad (left the skins on) I did bell peppers and onions with italian seasoning, we throw them in with everything. Banana peppers, I can’t make enough. I hope you don’t give up all together on pickling. I know I have made som bad pickles, but I’ve also made some good one. I’m a canning newbie, so I’ve just been in the research phase before starting with pickles and jams this season. I’ve come across some stuff about steam canning instead of water bath canning, and I was wondering what your thoughts are on this non-USDA approved method. I’ve looked at actual data from someone researching the steam canning method for high acid foods and it looks legit (a graduate student’s thesis using controlled conditions and replication, not someone messing around with a thermometer in their kitchen). I’ll be starting with water bath canning (and will probably only use this method), but I just wanted to know your thoughts! I enjoyed this post as well – I definitely have the same issue – I get crazy about canning but have not always prioritized the things we’ll be most likely to eat (except I have done a ton of tomatoes and salsa). Anyway, I also appreciate your thoughts in this post and others (especially the larder challenge posts) on throwing together quick meals from ingredients that are coming from the pantry (including home-canned ingredients) and freezer. One problem I’ve had, though, is that frozen casseroles and “meals” (except for some chili and soups) don’t always survive the freezing process well (and the kids won’t touch them)…thus I’m coming around to thinking that it’s much better to combine several frozen, home-canned, or dry-good “base” foods (that can be prepped quickly) – like rice, salsa, etc.- rather than thawing out a pre-made meal. Are you planning to share some of the recipes you came up with during your larder challenge? It might tie together those posts with this one nicely. I’m interested in recipes like your strawberry jam ice cream recipe…or your note above: “one pint jar of tomato sauce + one small can of tomato paste + seasonings makes a good pizza sauce without further cooking.” Thanks! I have nothing left from last year except dried beans and parsley. I usually manage frozen blueberries and tomatoes, and dried herbs. Last year I didn’t save enough of these. This year I’ve planted a lot more tomatoes and peppers than before, partly thinking of my mother-in-law’s delicious pickled green cherry tomato recipe. I hope to do a better job of harvesting my herbs in time, using the tomatoes that haven’t ripened by frost, and making enough tomato sauce or paste to last longer. I really want to try canning, and have several friends who are old hands at it. This article, including the comments, is just the inspiration I need.